Opera in the British Isles might seem a rather sparse subject in the period 1875 to 1918. Britain was notoriously described as the land without music, even the revival of the native tradition of composers did not include a strong vein of opera. Sir Charles Villiers Stanford, who himself composed a substantial body of operas, did not include the subject at the Royal Academy of Music. 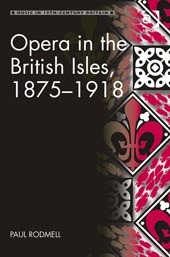 In this new book from Paul Rodmell (lecturer in music at the University of Birmingham), Opera in the British Isles, 1875-1918, the author aims to find what was happening operatically. The results are somewhat surprising both in the number of performances, the access people outside London had to opera and the number of new works performed. Rodmell demonstrates that there was s significant amount of opera going on, albeit of a rather variable quality. The book is part of a series from Ashgate Publishing, Music in 19th Century Britain, which seeks to explore the wealth of music and musical culture of Britain in the 19th century. To explode the myth of the Land Without Music. Rodmell's book is thematic rather than strictly historical. He starts with a survey of opera in 1875. The year was chosen as start date because it was the year of the first London appearance of the major touring company Carl Rosa Opera, the inauguration of the project for a new National Opera House on the Victoria Embankment and the definitive establishment of the operas of Wagner in the repertory. Carl Rosa Opera was important as a significant company playing London in parallel with Covent Garden. The opera house project was an unfeasibly idealistic scheme, but one which helps to articulate the Victorian's concern with a national style in new operas. And Wagner, of course, represents an important step in the modernisation of the operatic repertoire. Rodmell also draws a strict line between grand or serious opera and operetta or musical theatre. He considers only grand or serious opera, on the basis that the Victorians and Edwardians were quite clear on the distinction. Most operettas and musical comedies were produced in runs of a single show (as in the Savoy Operas), whereas grander, more serious opera was produced on a repertory basis with a different show each night. The dominant centre through the whole period was Covent Garden opera house, though even there things went through some vicissitudes. For most of the period Covent Garden was the main opera company in London, as such it formed the model for many other opera companies in Britain. The grand opera season at Covent Garden was for much of this period referred to as the Italian season; initially everything was in Italian, including the French operas and, at first, the Wagner. Opera was a commercial business in Victorian Britain (and remained so effectively until the founding of the Arts Council after the Second World War). The view was that if you had a good product it would sell. The other important element was class. And the grand opera season at Covent Garden coincided with the London season and the aristocratic patrons (and their subscriptions) were the opera house's mainstay. So the repertory was heavily influenced by the patrons wishes. The operas at Covent Garden were star based, the aristocratic patrons were interested mainly in the performances of the leads, the rest was a bit haphazard to say the least. This created the impression that the best opera was an aristocratic, star-based object. And the repertoire was essentially reactive, new operas had usually done elsewhere first. Only when Thomas Beecham was introduced into the mix, were new operas (ie. UK premieres as well as world premieres) chosen with flair, imagination and an eye on what novelties would appeal. All this meant that smaller companies had difficulty in sustaining the model. But Rodmell has done his research and the book is full of admirable detail and tables, both for performances in London and the provinces. These make fascinating reading, seeing what was and was not popular. (For instance, the most performed composers at Covent Garden in 1871 to 1874 were Meyerbeer, Verdi, Rossini, Donizetti, Mozart, Bellini, Gounod and the top three operas were Gounod's Faust, Rossini's Il Barbiere di Sivigla and Mozart's Don Giovanni). So we can see quite clearly what was going on. His description of the mechanics of opera production in the provinces makes for interesting and illuminating reading, what with the use of locals to stiffen the chorus and orchestra, the generally small size of ensembles and the rather slap dash production values. As with Covent Garden it was the leads who counted. And again this was all a commercial operation, tours needed to make money and, unsurprisingly, most companies eventually went bust. (Rodmell lists an astonishing 34 different companies touring the provinces in the period 1875 to 1918). The slightly surprising thing is the number of operas by composers from the UK that were premiered. Covent Garden did few but other companies were more adventurous. Rodmell tables a remarkable number of premieres. The sad thing is that most have not been revived and probably do not warrant it. Mainly this is to do with the state of British opera, and the failure to develop a real national school. But it also reflects the unadventurous of choice for the repertoire and certain lack of confidence, few composers seem to have had the opportunity to develop their skills with a run of works (only Stanford and De Lara really come into this category). The question of national opera is also addressed as it was of concern to the Victorians. No solution was found, the National Opera House was an expensive non-starter. Rodmell lists all the known premieres of operas by UK composers and it is an impressive list, but they do not coalesce into a school and only a few would seem worthy of serious revival such as those by Boughton, Stanford and Smyth. No typically English, Irish or Scottish style ever developed and the spirit of Wagner hangs heavy over the librettos and subject matter. After his description of Opera in the British Isles in 1875, Rodmell has chapters on Opera in London 1876 to 1896, Opera in London 1897 to 1918, Opera in the Provinces, and 'The Operatic Problem' followed by a list of all the operas by British and Irish composers premiered in 1875 to 1918, with details of the opera, plot and further background. Finally there is a summary of opera in the UK in 1918, and the amazing thing is quite how little has changed. Rather sadly it would take a second world war to bring that about. This book is an impressive piece of research and will be an invaluable resource for anyone interested in the field, but there is no denying that the book is something of a dry read. As I have said, this is a book of lists and to get the most out of it you have to enjoy lists. There is the occasional good story or lively anecdote, but the core of the narrative is essentially who did what and when. As such it helps illuminate chapter in British operatic history which is little written about. Joined up planning or simple point-scoring? Opus - the circus meet Shostakovich!